Clemson and Kansas State have now dropped from the undefeated ranks, further depleting the teams making bids for the top two spots, setting us up nicely for November. We'll obviously lose at least one more undefeated next week, with LSU traveling to Alabama. We could be running low on undefeated AQ teams soon, and that's when the controversy usually starts to heat up. 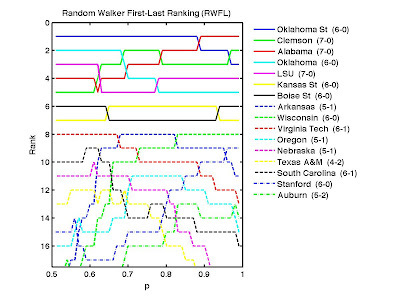 Even with losses by Oklahoma and Wisconsin now on the books, we still have a traffic jam near the top of the RWFL rankings. Six undefeated teams crowd the top (with two other undefeateds joining them in the plot below). 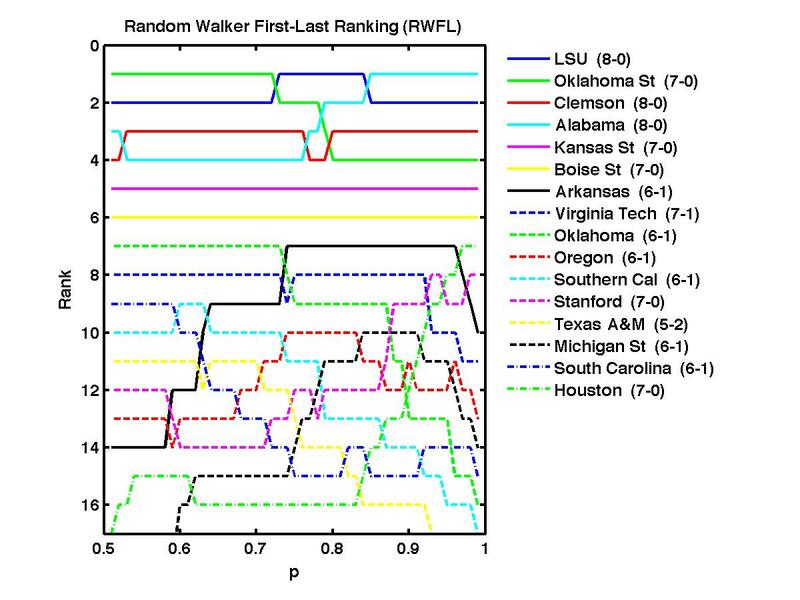 LSU, Oklahoma St, and Alabama each take turns in the top spot as one considers different values of the bias parameter p.
With a fleet of undefeateds still out there, the observation of the week is about how jumbled the RWFL rankings are, both this week and compared with previous weeks. 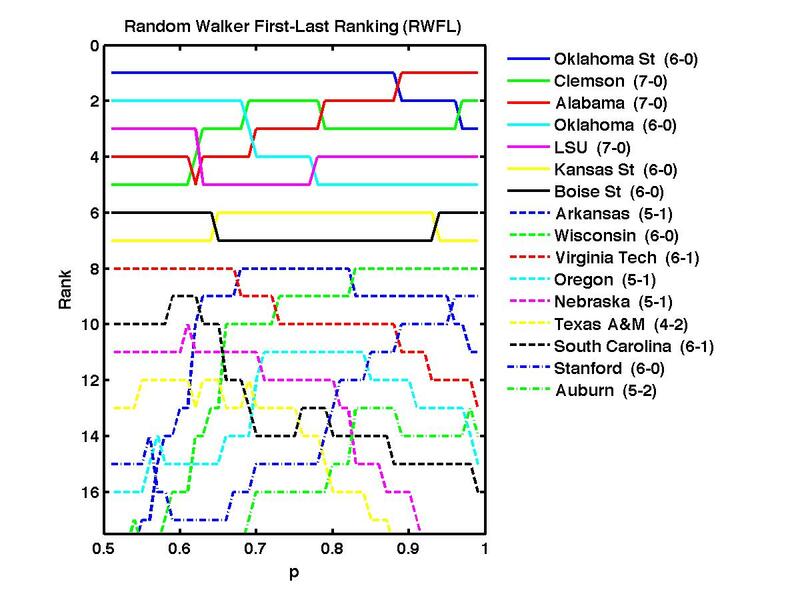 As seen in the plot below, four different teams appear in our top two for some values of the parameter p: Oklahoma State, Clemson, Alabama, and Oklahoma. Contrast this with the plots from previous weeks, when we of course had less game data. In particular, it's worth mentioning again that these rankings are based only on the final information about who won and who lost. No scores, no stats, no scouting. Just wins and losses. That is, just like the computer systems in the BCS Standings. So strong conclusions are necessarily made from limited information. But we'll have more of that information every week. And of course the other undefeateds are ready to move up if given the chance. With so many undefeated teams at this stage of the season, the questions are all about comparing measures of strength of schedule. The plot below shows just one way of varying the meaning of strength of schedule from the game results we have so far this season. This will all get a lot more interesting as the number of undefeated teams falls. Last evening was the first time this season it was cool enough for a good fire pit, adding to my personal sense that Fall is here and further inspiring me to start the Random Walker First-Last (RWFL) rankings for the 2011 college football season. We are once again enormously grateful to both Peter Wolfe and Kenneth Massey for making this task easier on all of us. Both are part of the official Bowl Championship Series standings. Wolfe provides the data in an easy-to-process form. 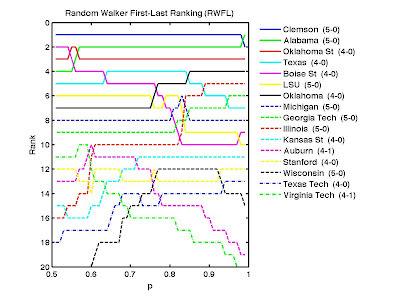 Massey publishes the College Football Ranking Comparison. 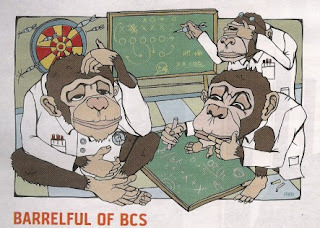 We have nothing to do with the official Bowl Championship Series standings. We provide these rankings for fun as an example of how the teams might be ranked using a simple "my team beat your team" argument. 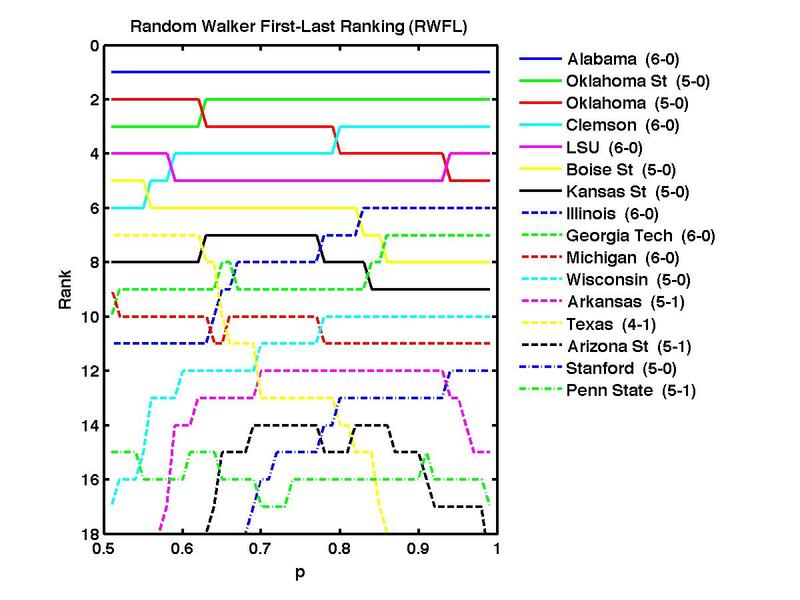 As described in our papers and elsewhere on this blog and its links, the RWFL ranking system has one "free parameter" p which loosely speaking relates to the balance between strength of schedule and overall record. When p is close to 1/2 (the left edge of the figure below), quality of opponent plays a strong role. As p increases towards 1 (the right edge), single-game victories and going undefeated matter more. 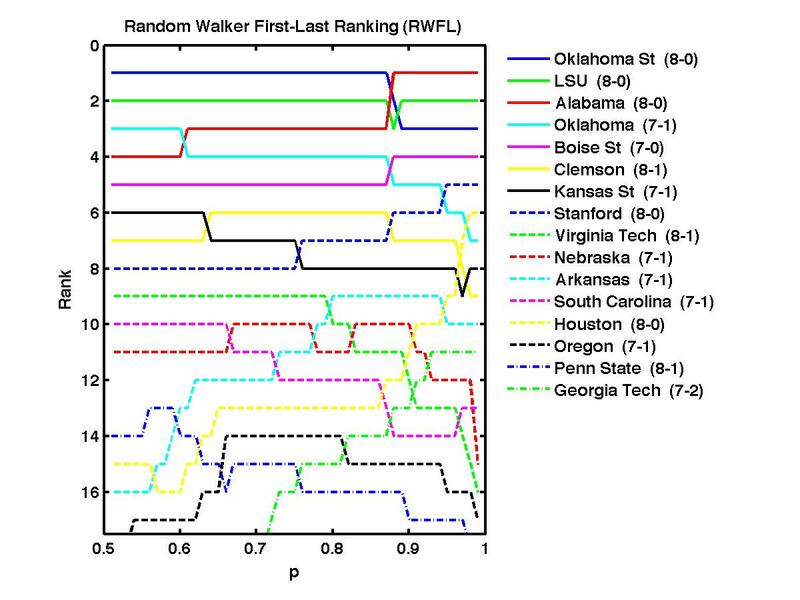 We will continue to post plots representing the placement of the top-ranked teams as we vary the p parameter in the RWFL rankings. 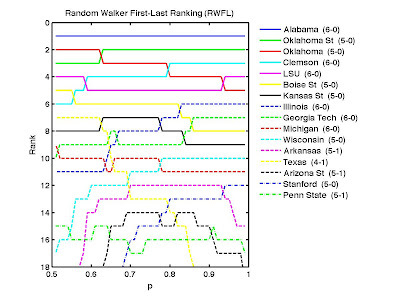 Looking at different values of p is of course just one of many ways to modify the rankings; but they sometimes lead to a quick observation about how sensitive rankings are to different ways of valuing the importance of strength of schedule. That said, such changes have elaborate follow-on effects---changing the ranking of one school impacts the rankings of all of the schools they played, and so on---so that it is often difficult to make quick sense of why this one change affects the rankings. 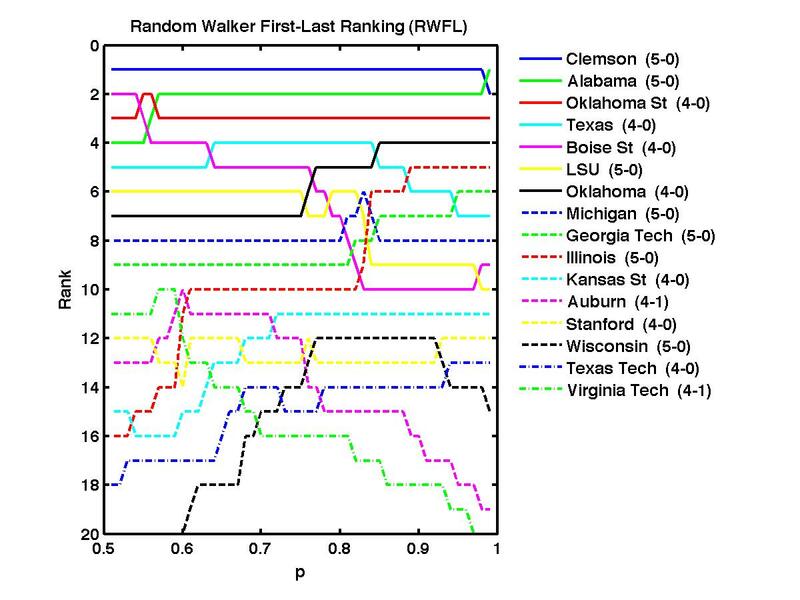 Looking at the figure below, Clemson is ranked #1 at almost all values of p, except very close to p=1 where Alabama slides into the top spot. There are some large movements in the figure, with Illinois ranked at #16 near the left edge but moving up to #5 near the right edge. Why do these changes occur? One could try to weave a story, but with so many undefeated teams right now it might just be easiest to wait for more football to be played. 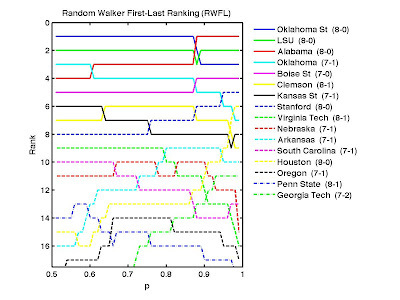 The RWFL rankings at p=0.75 run on the full network of connected teams should appear in Massey's comparisons for this season starting this week (where the rankings are broken out separately for the FBS and FCS). 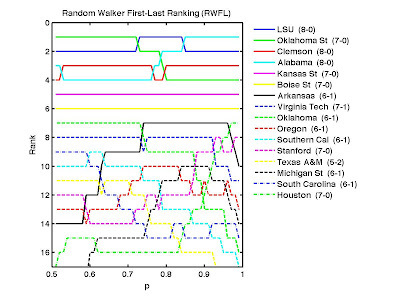 The rankings on the restricted network including only the FBS teams are equivalent to Eugene Potemkin's "E-Rating" that sometimes appears there too.